Could you be the next big art-world discovery? Now's your chance to step into the spotlight. 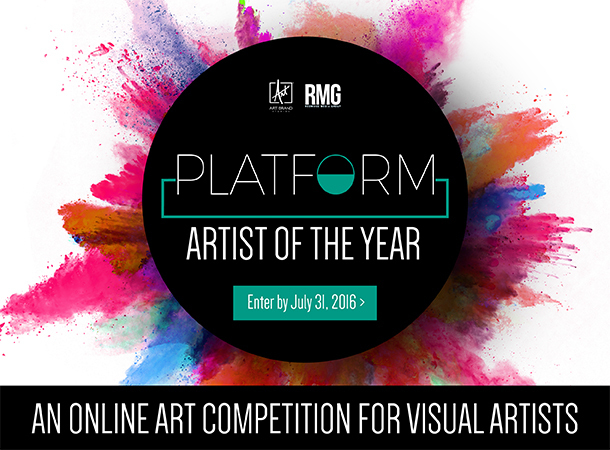 Redwood Media Group's [PLATFORM] Artist of the Year contest, produced in partnership with Art Brand Studios, is the premier awards contest for visual artists of every type, with prize values of up to $65,000. We've created this program to empower talented artists and introduce their work to the world. Are you the one we're looking for? Our panel of art-industry judges will select one grand-prize winner and nine finalists, as well as special award winners in the categories of sculpture, glass, mixed media, and photography. The winner will receive prizes valued at $65,000, including $10,000 cash, a contract with Art Brand Studios, and numerous exhibition opportunities at RMG's 2016–2017 shows. The nine finalists will receive prizes valued at $30,000 each, including contracts with Art Brand Studios and inclusion in RMG's marketing throughout the year. To read all of the exciting prize details, check out our Official Contest Rules. We've made it easy to enter—and we want to see all types of artwork. We welcome submissions in the following mediums: painting, photography, mixed media, drawing, sculpture, glasswork, and more. Just head to our registration page, where you'll be prompted to tell us a bit about yourself, submit your entry fee, and upload three to five images that best represent your work. Our judges are looking forward to seeing all the top-notch entries roll in! Copyright © 2016 Redwood Media Group, All rights reserved. You are receiving our newsletter because you signed up at www.redwoodmg.com, www.artexponewyork.com, www.art-sandiego.com, www.spectrum-miami.com, www.spectrum-indianwells.com, www.artsantafe.com, www.reddotartfair.com, www.artbusinessnews.com, www.decormagazine.com or signed up at a Redwood Media Group event.